How is it possible to bend the vector (along with a line – marked green in the image – which will serve as a reference) along a circular arc (of arbitrary radius)? Assuming the line is drawn along the mean of both the horizontal guides from edge to edge of the vector (i.e. with 145.07mm length in the screenshot). The arc has the same length as the line, and after the transformation, every point in the reference line will lie along its corresponding point on the circular arc. I understand this is a simple rectangular to polar transformation, but can't find a way to do it in Inkscape. I can get close results with "Bend path" effect, but close is not enough. I am okay with using some other software (as long as it is FOSS and can do it without much effort). The color was lost, but normal coloring works. A red fill was selected. Copy the graphic. Then choose the Bézier tool. In the tool options, choose the option that says "Bend from Clipboard". Draw a curve with the Bézier tool. A nice feature of using a Bend path effect is that you also get an interactive control to adjust the width of the graphic. 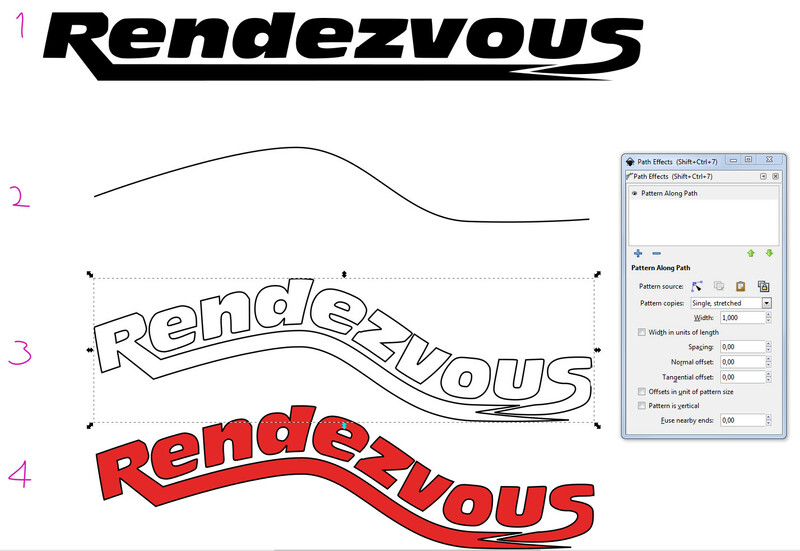 Inkscape: How can I bend text like in this example?